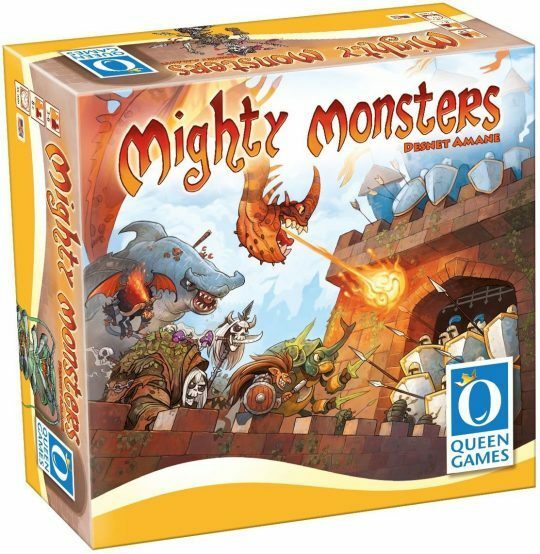 A group of monsters is traversing the perils of the castle conquering guard after guard, collecting treasurers along the way, as kings set new rules. You and your fellow players are these monsters in Mighty Monsters (first announced as Heroes’ Gold). The game is played in rounds equal to the number of players, except that in a three- or four-player game the number of rounds is doubled. Each round has three phases — Placement, Resolution, and Cleanup/Setup — and is controlled by a king who sets a special rule for the round. Players can choose from six races of monsters; each player receives a unique set of five monster cards in their chosen race with strength ranging from 1-5 and healing costs ranging from 0-2. To conquer the king and therefore conquer the castle and gain the treasure, players in turn order may place an available monster from their hand on any empty guard space in the castle. Once the placement phase is over, guard cards are revealed one at a time and resolved, working your way towards the king.